Premier Decorations Mini Gutter Hooks. Lit Length: 10M. It can be hung indoors in a window for example, or used outside on a hedge or most traditionally,along the roof or window line of your house. Use rope lights safely. Always read the label and product information before use. Premier Decorations 5ft LED Tree With Timer - Warm White. Condition is Used. Dispatched with eBay delivery – Shutl 2-3 days. If the bulbs in the picture do not look like yours and the information is different then they will probably not fit your set. I have included a picture of the two types to help all you people trying hard to find the right part. Perfect for hanging Christmas Lights. 150cm LED Cherry Tree Christmas Tree Indoor / Outdoor 150 Blue LED's. Condition is Used. Collection in person only. - Premier 200 Multi- Action Battery Operated Time Lights - Warm Whitei coloured LEDs - Long-lasting, energy efficient and superbright - Up to 30 Days Battery Life - Consumer controlled Push button timer: 6 hrs ON / 18 hrs OFF - Lights automatically come on at the same time every day - No need for electrical socket - waterproof battery compartment - Memory controller with 8 light sequences - Suitable for indoor and outdoor use - Low voltage LED lights for extended battery life - Product Length: 0.3m approx battery pack to first light - 20m approx first to last LED - Requires 3 x 'AA' batteries (not included). This is compatible with the new and exclusive Battery Eliminator adaptor! If you are fed up of changing batteries then simply add this to your basket. The Eliminator does what it says on the tin and removes the need to keep adding batteries. New listing24 Piece Gutter Hooks - Perfect For Hanging Lights - Free UK Delivery! 24 Piece Gutter Hooks - Perfect For Hanging Decorative Lights. Mini Gutter Hooks. Suitable for securing lights and cables to gutters for Christmas. Strong clear plastic. Ideal for most gutters. 40cm Dark Brown with Red Berries Premier Pre-Lit Decorative Twigs 16 Warm White LED Battery Operated Requires 3 x AA Batteries Not included. LED bulbs are non replaceable Glass and Christmas decorations not included, shown for illustration purposes only Great for Christmas or all year round. Ensure adequate airflow around each LED. Multi action 140 Supabrights. 140 Supabrights Indoor & Outdoor Use - White Do not unscrew or twist the LED. Do not connect this light set electrically to any other light set. These bulbs were manufactured to fill the gap in the market. These bulbs were made in china. The RL46 light sets are quite hard wearing. If the bulbs in the picture do not look like yours and the information is different then they will probably not fit your set. PREMIER 100 WARM WHITE FAIRY LIGHTS. 100 LED mains operated fairy lights. Suitable for indoor and outdoor use. Warm white LED's. Model: LV122753WW. Cable length from first bulb to last bulb (Approx): 5.94m. >> Connectable Lights. >> String Lights. Outdoor Living. > Christmas Lights. >> Icicle Lights. >> Cluster Lights. >> Rope Lights. >> Net Lights. >> Connectable Lights. 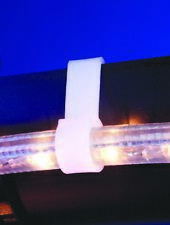 Extension Lead for Connectable Lights. Ending Soon. > Christmas Lights. >> String Lights. >> Icicle Lights. >> Cluster Lights. >> Rope Lights. - Premier 480 Supabright LED Lights - Multicolour LEDs - Green Cable - Energy efficient supabrights - Suitable for indoor and outdoor use - Product Length: 10m approx lead cable to first light - 48m approx first to last LED. Available in red or green, the colour will be assigned at random. Complete with assorted decorations. 100 set of Christmas fairy lights i have 1 set available not LED. [Premier Multi Colour With Adaptor 1No.]. [Blue 2 Nos.]. Needs Adaptor. Cable length from plug to silhouette approx. Silhouette approx. 23cm x 45cm. Light up Picture, Suitable for Indoor use only. Suckers included for attaching to the window. Can I have my order faster?. Premier Bulb No CHLC100PE. 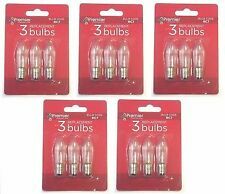 These bulbs are from spare Premier Decorations light sets and have been tested to ensure they are in working order. What you see listed is what I have. These bulbs are made by Premier Decorations. Lamp Code: RL1509. CLEAR BULBS . 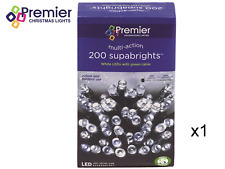 Premier 200 Multi Action Supabright Bright White LED Lights with Green Cable.